TC Construction Company has been providing high quality hazardous abatement and demolition services for many years. 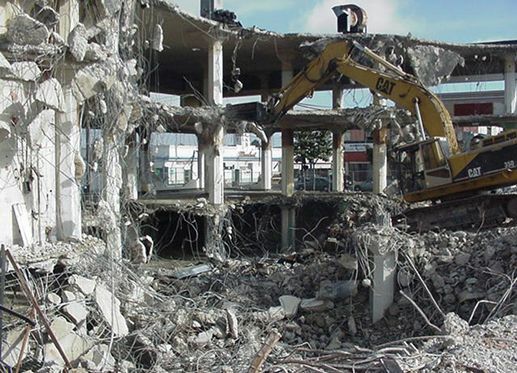 Our experience includes the hazardous abatement and demolition of large 4-story concrete structures, large apartment complexes, underground concrete military bunkers and small personal residences. Our capabilities include the decommissioning and abandonment of underground utilities, wells, storage tanks for oil, diesel and gasoline, and soil remediation. TC Construction has always exceeded the city and county requirements for construction and demolition debris recycling. We will work with owners to provide cost effective ways to meet all city and county recycling requirements on every project. Given the increasing environmental impact concern surrounding all construction and demolition projects, it is important to provide options for processing recyclable material. Because we own our own portable crushing plant, we are able to recycle all inert materials onsite, and produce a spec base for paving areas and backfill material for new onsite utilities. TC Construction Company’s LEED Accredited Professionals are able to guide the owner and project through the process necessary to acquire the most recycling/reuse points available on a LEED Certified Project. Please visit www.usgbc.org for more information on the benefits of LEED Certified Projects.